Darío Escobar creates art from mass produced merchandise. For the Guatemalan artist, identical ready-made objects are an ideal raw material for contemporary sculpture. Sporting equipment is a running theme in Escobar’s work, and he has produced sculptures from skateboards, baseball bats, and basketball hoops. 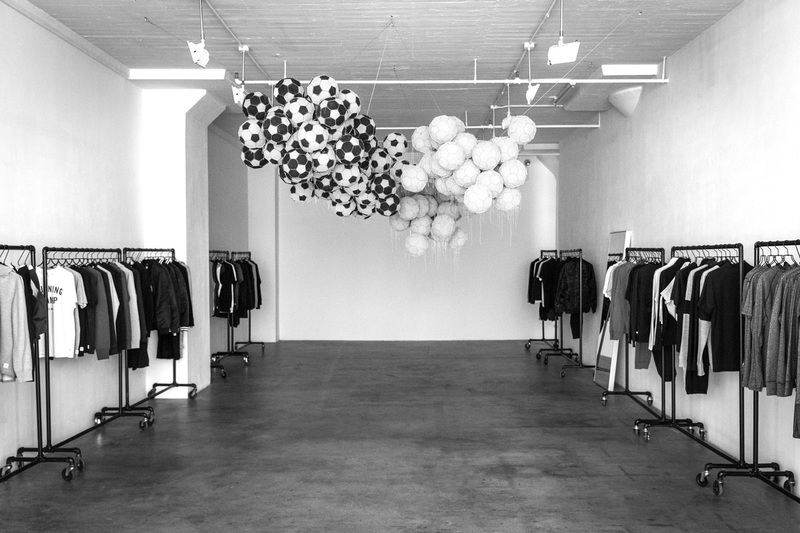 The series Obverse & Reverse repurposes one of the world’s most familiar objects – the soccer ball – to convey Escobar’s ideas in floating clouds of black and white. 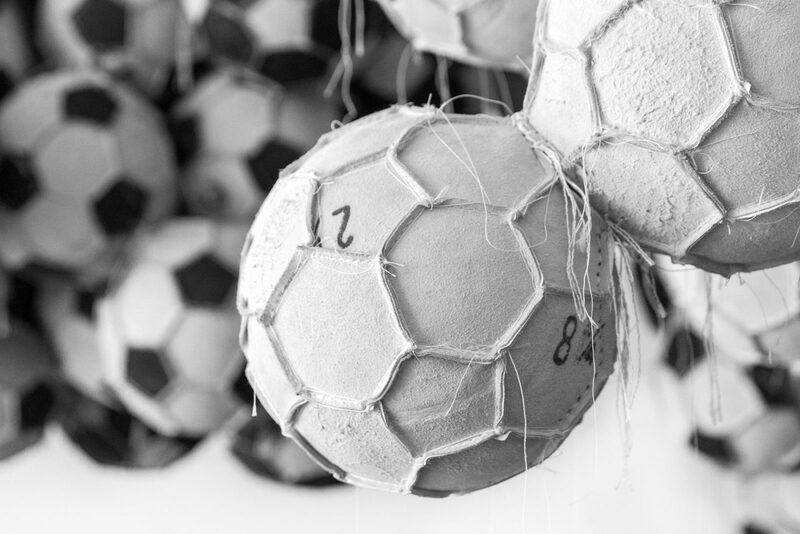 Each ball is turned inside out and carefully re-sewn, exposing the texture of its leather and countless intersecting threads. One of Escobar’s latest sculptures, Obverse & Reverse XLI, is installed in our bi-annual New York City showroom. We recently connected with the artist to discuss the process of creating the work, and the function of art in our time. In what ways have sports played a role in your life? I came to sports because of my interest in objects. I have always worked from the industrial object, and I have been interested in the "exchange value" of them, especially in the operation where merchandise ceases being such, and acquires a cultural value. My workshop is located in the Historic Center of Guatemala City, in the middle of popular markets and street merchandise sales. I discovered a group of objects that captured my attention, and I thought to investigate in a sculptural format where the axis is the obsessive accumulation of the same industrial object (baseball bats, soccer balls, skateboards, etc.). All of the above led me to a territory of cultural cartographies that caught my attention because I discovered the new "urban tribes" (people who had true affinities for what they consumed, more than for the cultural features they shared: religion, language, ethnicity, etc.). That's where I saw that I was facing a kind of "new identities" that were strengthened through aesthetic, economic, cultural and recreational affinities, among others. All this opened the door to start working on the "identity of objects". Sports are a unifier, a shared language that transcends traditional divides like class, race and education. The language of contemporary art can be much less accessible. Is the work you produce from sporting equipment an effort to make contemporary statements in a common language? As we all know, art is one of the most universal languages that exist. I have always been interested in working with polarities: the cult / the popular, the past / the present; working this way resolved me to confront the spectator within a territory of much more familiarity for all. In short, it is an effort to make the complex accessible, and extend territories. How has this affected the perception of your art? It has made my work expand to deeper conversations and more ambitious contexts such as the recent commissions I did for the Mecerdes Benz Stadium in Atlanta, or on a smaller scale the commission for the Detroit Institute of Art Museum (DIA). Is this bridging of worlds fundamental to your body of work as a whole? Absolutely, as I mentioned before, working with polarities made me rethink the formal and conceptual relationship of my work, made me rethink the limits between the popular and the cultured, made me blur the boundaries, and this is a great bridge between two worlds. Can you describe the process of producing Obverse & Reverse XLI? 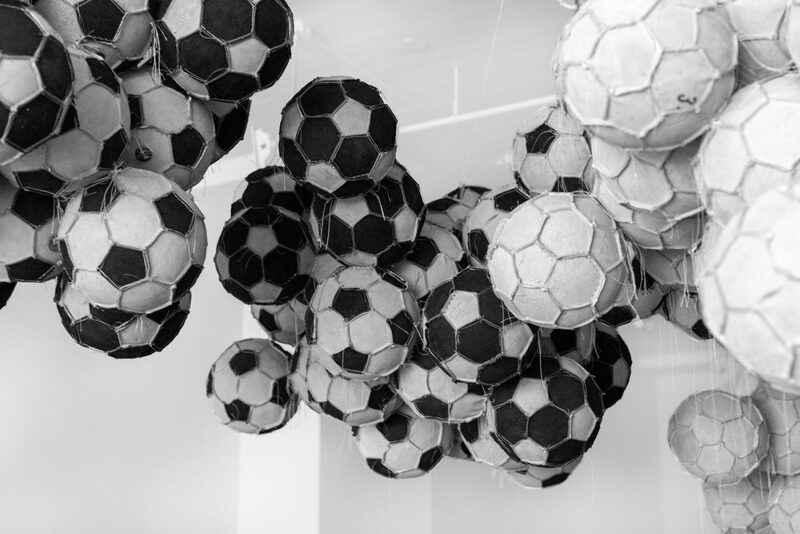 It is an exhaustive and very specific work since this art piece has 120 soccer balls sewn together forming four modules. The soccer balls are produced in an artisanal way in places where leather objects are worked at a popular level, then they go to my workshop where my team and I started the work of "accommodating" or rather "constructing" the sculpture, then it starts the process of working the anchors determine heights and work on basically structural aspects. Are the balls you use for Obverse & Reverse used or new? I am interested in this particular project to use new soccer balls, without any historical burden, because I am interested in the object to acquire a change of meaning rather than a change of direction. This allows me to work within "a blank page". I am interested in changing the function of the object, not its meaning or its symbolic charge. It is the same game but with new rules. The title Obverse & Reverse seems to allude to a coin flip, a symbolic moment of fairness before the beginning of a game. But coin flips have also have an element of chance, of fate, and a decisive winner and loser. Can you speak about the title, and what it captures in the work? The title of this series of works invites us to think about the interior and exterior of things. These soccer balls are opened and turned: The inside is now the outside: What was inside is now outside. More than a flip of the coin to determine the fate of something, it is for me an invitation to change the angle of view of things in general, I think of a change of perspective on people, things and art itself, It is a good time to put everything away and tune up the gaze. Somehow it’s seems that, by turning these objects inside-out, you’re highlighting the connection between them. Simplifying them visually creates a sense of unity, but does this act of exposure touch on something deeper? This is an exercise where I propose to think about our connections, as you say. To bring the object to a first phase in its construction (because soccer balls are built in reverse) is to bring it to a new aesthetic experience. I think we should start talking with art from other perspectives, from other angles. It is not new that art is nourished by the experience of popular culture or re-contextualization exercises, but perhaps we should think of more eloquent and solid connections: formal approaches and more gestural operations, we must also deepen that the experience of art is not restricted to institutions, museums and galleries but to public spaces and coexistence. If life itself is an aesthetic experience why do we take it to categories so far from the viewer? Why can its transfer be so boring? I recently read an essay by the artist Mathias Goetritz about what he called "Emotional Architecture", and I thought about the idea of "inhabiting art" ... inhabiting the form ... we will have to keep thinking about this, I find it very interesting. 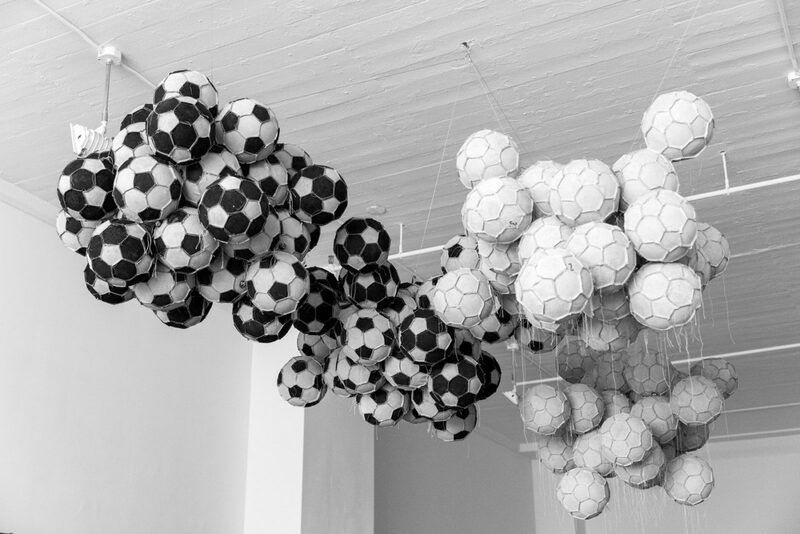 In a store, new soccer balls are typically displayed in geometric forms: rows, cubes, pyramids, while the Obverse & Reverse series features organic forms reminiscent of clouds or molecules. How does form play a role in this work? I have always been interested in the forms that define themselves within a free structure, I am interested in a rather "liquid" sculpture format: that takes the form of the container that contains it. 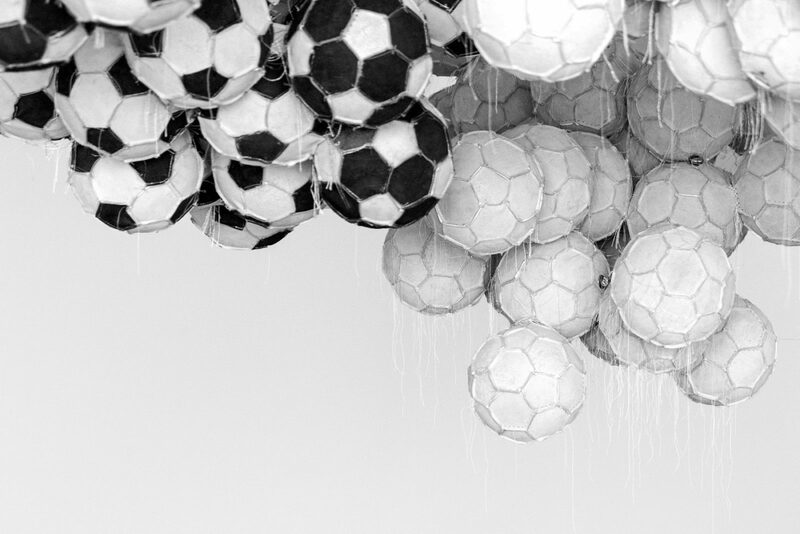 For this reason, the sculpture constructed from soccer balls is an exercise in a way that flows freely without limits or restrictions, it generates a new order: "Chaos" is probably a more logical exercise in the universe than in our societies. Can you speak to the importance of the threads? 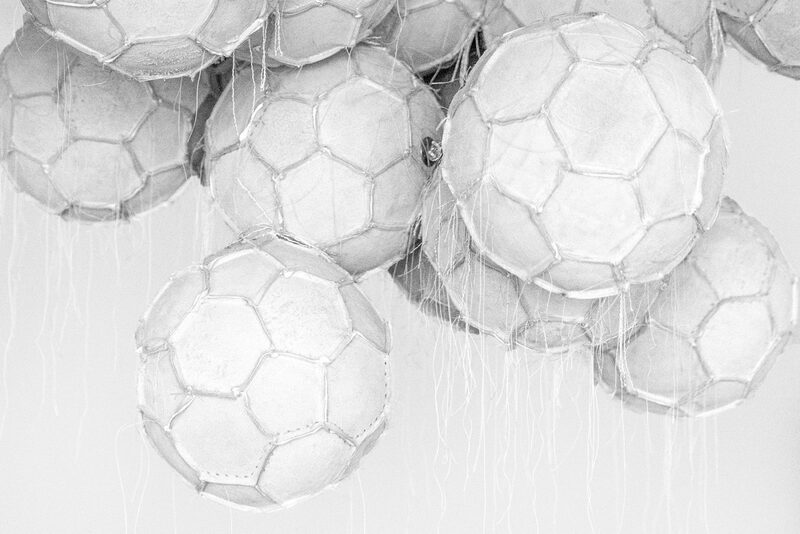 The threads exist inside the balls themselves, they are a space of movement that is free of control, the truth is that they are part of the history of the soccer ball, are symptoms of their own imperfection, which I find fascinating because now that they are exposed they are like a drawing in constant movement. Are the Obverse & Reverse works influenced by your home country of Guatemala, its history and culture? Definitely being in Guatemala is a determining factor for my work, I live in a country that has more than 7,000 years of producing art and this strongly determines my creative route. Guatemala is a country with multiple contradictions and problems as everyone knows, there is violence, poverty, inequality, etc. But in one thing Guatemala has always been in tune with the rest of the great world capitals producing culture, and it is the production of art and literature. With all the above, I will tell you that my context is fundamental in the development of my ideas. Some themes we’ve touched on – transcending division, polarities, unity, shifting perspectives – are very relevant to our current moment, where traditional orders seem to be in regression, and conflict on the rise. How does your work connect to the times we live in? I think that artwork is always a symptom of the historical moment that it has to live at, although we live in a time where the divisions are more radical, we also have more tools to confront and denounce these divisions and see our strengths. I think that the connections that art can give you are always more sensitive and perceptive, although art does not change the world, if it can awaken a "something" that will leave us with a feeling of advancing more ... and this is the trigger for any change, perhaps this is the function of art at this time. It is a complex moment for humanity, let's not say for all the aesthetic or intellectual manifestations, there is a lot of "noise" everywhere ... Probably we will have to dig in, do what we know how to do to grow, so that when all this is over our ideas are so strong that we can give shade to everything that could not overcome "the novelty" of the moment. What are you currently working on, and is it informed by this moment? This year started with a large solo exhibition in Copenhagen at the Nils Staerk Gallery, and I also completed a commission at the Detroit Institute of Art Museum (DIA) and other projects in Kansas City, Miami, Sao Paulo and New York. It is a time of change, I am moving to Mexico and closing a cycle in Central America, this coincides with the publication of my second book in the United States: Darío Escobar / The Life of The Object, distributed by DAP / New York. It has been a moment to realize that there has been a road traveled in more than twenty years of work, but it is clearer to me that – fortunately – I still have a long way to go.